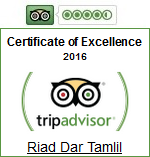 Our stay in this Riad was so great, the staff was so helpful with tips to do and everything. It is so near the main square and in a safe area so you;ll never feel like you;ll have to walk to far or be scared on walking through dark alleys. They give the typical breakfast in morocco and they clean your room everyday which is great !